Well it's been a great week - sunshine at last and the Chelsea Flower Show to watch on tv - and great at work too. We have recruited a new independent trustee with first class experience and expertise in marketing at the highest level (international blue chip company). She describes herself as a "do-er who wants to be hands-on" so she will be a huge help to us. Simultaneously, the cunning plan to arrange a smooth succession to our Chairman, David Hypher DL, is taking shape, and we have another outstanding person who will hopefully be taking on the Chair role in succession to David if all goes well. So having also recruited someone else with a strong social enterprise background to the Board we have in prospect a scarily brilliant Board! The good news continued with the fact that Tim Loughton MP (Minister for Children and Young People) has confirmed he will be our guest speaker at our AGM on 8 November at 6.30 pm. Quite a coup for a small charity like us..big impact. The focus this week has been on shaping the Surrey Social Enterprise bid, which I'm doing by addressing the "what's the evidence of need?" question that potential funders rightly ask. I have also been preparing the set-up for a tricky discussion between a member organisation and the County Council about the future of a particular youth centre building. I guess I should be flattered to be undertaking the brokering role, but it is at the risk of being shot at by both parties afterwards. I was at the Surrey 14-19 Partnership on Monday, chaired by Garath Symonds Surrey CC Assistant Director for Young people. It was a good meeting. What struck me most though was the real antipathy amongst some senior educationalists to the Government's education agenda, including raising the participation age...on grounds of lack of resources to support it. Good point to put to the Minister on 8 November. On the funding front I have drafted an "Annual report" letter to all our Patrons about 2011/12, and future prospects so that they are aware of what we're about. They are all distinguished and busy people, and so we send a good old fashioned paper letter to them. Talking of which (paper letters) did you see the piece in the news (BBC website and The Times) to the effect that fountain pens have now become trendy? I rest my Parker Duofold case! I am either ahead of, or behind the times...so off trend that I am in fact on trend so to speak. Remember I am the theology man and used to these ambiguities! seem to have caught a cold/cough as well, which has not helped. particular people, and we will then report formally to the Board. 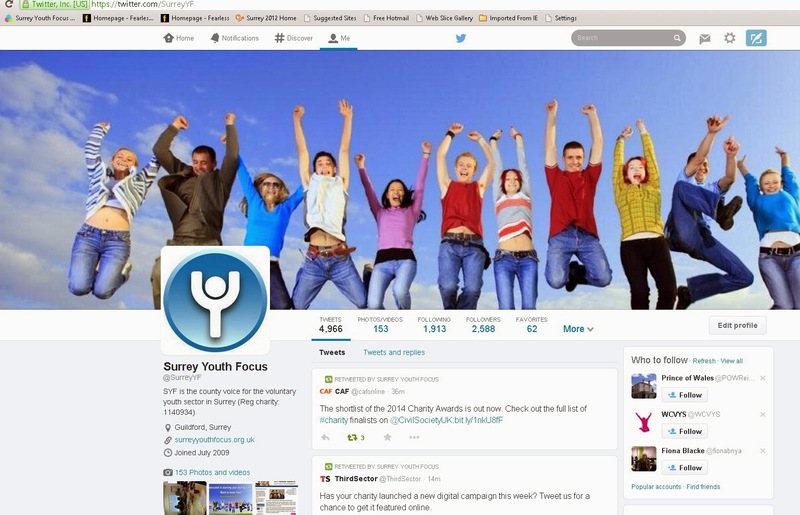 bring a great deal to Surrey Youth Focus and to its members. business as a social enterprise. Hi folks, sorry I have missed two Fridays worth of blogs, but it was my wife’s birthday on Friday 4 May, so I took the day off so we could go to Kew Gradens..in the cold..and rain..I then had last week off to draft the famous MA dissertation. I know you want to know what it’s about, and now that I have finished the 20,000 words and sent it in to my tutor, I am in a position to tell you……but I won’t yet. I will give you the full story later, at the slight risk of my Stephen Fry / Barack Obama levels of blog readers falling off a touch. Guess what - EVEN my brother now reads this blog…and tells me that I have more readers than President Sarkozy…but I think there’s joke somewhere there. However, I would not want you to think I had been idle on my week off, and so on the birthday 4 May I took a call at Kew from Surrey CC who have asked me to do some "honest broker" work over a particular issue they face with a member organisation of ours, and, at the risk of entering the lions den I have said I will. Then on Saturday 5 May (yes a Saturday) we had a very good staff/trustees awayday working on our 3 year strategy. Suffice to say, that we cannot sustain more deficit budgets, so we have a cunning plan for the 3 year development of SYF. "Failing to plan is planning to fail". Then whilst on leave (just thought I’d get that in) I went to Surrey University to meet with a brilliant group of students in SIFE, which stands for Students in Free Enterprise – A heart for business. A Head for the world is the strapline. I went to canvass their views about our Surrey Youth Enterprise project, for which we are about to bid fro funding. The students were very quick to comment (positively) were challenging, and hugely impressive. Many thanks to them for their ideas. So..then back to work on Monday this week (my wife thinks I never left it) but with a filthy cold acquired after 4 year old grandson’s Superheroes Birthday Party with about 20 children, and noo immunity to children’s germs. So I was missing, but am now back- more blogging this Friday..and LOTS to say..much better than The Voice, Britain’s Got Talent, Man City (boo), Sarkozy…et al.